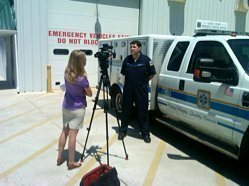 The Sussex EMS Office of Public Information strives to serve the residents and visitors of Sussex County by providing the local print and broadcast media the most accurate and up to date information on departmental activities and breaking news events. For media inquires during regular business hours, please contact Glenn Marshall, our Special Operations Coordinator. During non-business hours, please contact the Administrator on Call at (302) 854-5052.